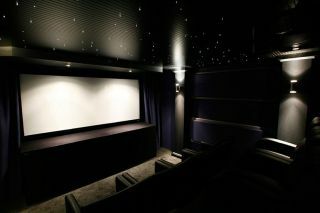 The Screening Room brings films to your home on the day of cinema release | What Hi-Fi? If you want to avoid going to the cinema and waiting for films to be released on Blu-ray, 'The Screening Room' should pique your interest. Variety has exclusively reported that Napster co-founder Sean Parker and Prem Akkaraju, an executive from SFX Entertainment, have pitched The Screening Room idea to movie studios, offering them a guarantee that films can be protected with a secure anti-piracy technology. Before you can rent the movies, you will need to spend $150 on a set-top box, then $50 for each film, with a 48-hour rental period in which to watch it. In order to persuade movie studios to get onboard, Parker and Akkaraju plan to give the majority of the $50 fee to the studios and take a $5 commission for themselves. It’s also been proposed that for each movie rented, the customer will get two free movie tickets, so cinemas can also profit from sales of popcorn, sweets and drinks. The Screening Room is apparently close to signing a deal with AMC cinemas, which itself is currently in the process of acquiring Carmine Cinemas. Variety says Universal, Fox and Sony are showing interest, but negotiations are still in the early stages. If the project does come to light, it could completely change the future of home cinema.